Update 9/21/2012: Here’s a Foreign Affairs essay I wrote about the roll of Salafis in the riots. Below are some thoughts I shared with a friend this morning who asked about the protests. I had to edit one pretty heavily in light of the events of the past few hours, and I’m sure I’ll have to revise them again in the coming weeks given how confusing everything is right now. If I’ve made any egregious errors in well-established facts, please let me know here or on twitter and I’ll update it. 1. Who’s behind the film? A Coptic Christian living in California who claimed to be an Israeli-American. Other Coptic Christians living in the US promoted the film on their Arabic websites and also enlisted the support of Terry Jones (ie Qur’an burner). 2. How did the film get to the Arab world? An Egyptian channel supervised by a Salafi cleric (Muhammad al-Zughbi) was the first to broadcast clips of the obscure film, which it likely obtained from YouTube. The Egyptian commentators on the news channel seem to be Islamists of the Muslim Brotherhood variety, if we can stereotype from appearances (short, full beards, suits and ties). I was told by a reporter that the host, Shaykh Khalid Abdullah, caters to Salafis (ie Sunni puritans). Consider him the equivalent of the usual Fox news commentators, finding obscure insults to their religion to fire up their conservative viewers. 3. Who’s behind the protests? 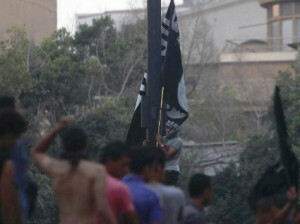 It’s not clear yet who organized them but Salafis and Ikhwanis in Egypt seem to have fanned the flames. Soccer hooligans and anarchists were also in the mix. Once news of their protests made it to twitter, facebook and satellite TV, it was only a matter of time before they spread. 4. Who will be targeted for retaliation? Copts are going to be a major target in Egypt, and anyone associated with the production of this film in the US is likely going to be targeted by Islamist terrorist organizations. Perhaps Israelis will be targeted too if it doesn’t get out that the director lied about his Israeli identity. YouTube/Google might also be targeted for carrying the film clips. As for the attacks on the US embassies, the protesters blame the United States for the film because many Arabs don’t understand how we treat free speech; they believe we have the power to censor films as is done in Arab countries or proscribe them with hate speech laws like those in Europe. 5. Is this just about the film? The film was the trigger, and most of those protesting are furious about it, whether they’ve seen it or not. Sabb al-nabi (insulting the Prophet) is bad, bad stuff in classical Islamic law (it’ll get you killed). But there are other things at play too, like public discontent with the slow pace of reforms and prominent officials and firebrands stirring the pot out of conviction or for more cynical reasons. 6. What’s al-Qaeda going to do? This is a major win for AQ. Protesters (some unwittingly it seems) are flying the AQ flag (specifically the Islamic State of Iraq’s flag) as _the_ flag of protest. Jihadis everywhere are celebrating this symbolic victory. If AQ was also involved in the killing of the ambassador, it’s a major operational victory. The fact that they are now shaping events in the more stable Arab Spring countries, in addition to their prominent profiles in the Yemeni and Syrian insurgencies, is a huge shot in the arm for the jihadi movement. They will try to capitalize on the Muhammad film by vowing to undertake revenge attacks on those responsible for its distribution. They will certainly blame the United States and perhaps Google/YouTube for not shutting it down. 7. What does this all mean going forward? If we’ve learned one thing during the Arab Spring, it’s the demonstration effect of large protests. People in the Arab world have now seen that the US embassies can be targeted with impunity for slights to Muhammad originating in the United States. There will certainly be more slights because “anti-jihad” Christian extremists in the United States and Europe will be all too happy to stir the pot, particularly after they’ve seen what can be achieved with such a shabby film. That being the case, we can expect more protests like these. New Islamist governments like the one in Egypt will have to be careful how they thread the needle. They have to strongly condemn known insults to Muhammad, and they can’t afford to curtail popular anger too much lest it be turned on them. But they’ve also got to be careful about alienating the United States. 8. Is there a silver lining? The reaction of Libyan citizens to the US ambassador’s death was pretty remarkable. Perhaps citizens in other countries will be moved to demonstrate similar solidarity with Americans against religious extremism of all stripes. Moreover, Obama’s unscripted, not-an-ally statement got positive results out of Egypt. I’d love to see more of the same to remind the more belligerent of the new governments that they should not take US support for granted. > Moreover, Obama’s unscripted, not-an-ally statement got positive results out of Egypt. Would love to see any evidence of this, as I’m sure this dose of pragmatism will be used as a cudgel against Obama by the Right. First off Will, fair play to you for posting your thoughts. A lot of folks would wait until the dust has settled so they can’t be corrected. As i sad on twitter with regard to #7 – a little too early to say they can do this with impunity. You did make me laugh at the ‘short’ reference because after thinking about it, theres a kernel of truth there. Point 3 is important as you highlight that the protesters are not some homogeneous entity all trying to uphold the honour of the prophet. Very often among such crowds you’ll find young men just looking or trouble. Living here in Belfast im all too aware of the ‘recreational rioter’ phenomenon. I think that is a point that could be emphasized more in the US media – that the protesters (whilst instigated by the Ikhwanis etc) are not all rabid puritans driven by their faith. I understand that in the grand scheme of things its the US whose the injured party here, but such nuance is important to make i think. In reciprocation the Egyptian, Libyan govts could highlight the differences in free speech the US has as you mention in point 4 – but thats a really vain hope i realise. As you mention in #6 – the AQ flag seems to have transcended its origins and become an overarching symbol of protest – how long before we see a Jim Fitzpatrick version adorning the student walls of of MENA? Back to #7 – it is indeed difficult for the new islamist govts to placate their populace whilst maintaining (at least) cordial relations with US. I do find the pearl clutching amongst some US commentariat funny – gasping at Morsi’s rather lukewarm reaction. The MB have long memories of Egyptian Dictators dungeons and the Western states who backed them. As regards #8 i was going to write that Afghanistan has not yet shown signs of any protests over this matter, but a quick Google has proven me wrong 🙁 So im struggling to come up with another silver lining…. Libya is not a silver lining but a different set of circumstances due to specific factors: First, the US was, unlike in Egypt and Tunisia, more decisive and the NATO cover made the overthrow possible. No Libyan is unaware of that. Second, we had a very well-known ambassador whose activities before, during and after the revolution were also known to all. Third, Libya is not fertile territory for a mass Salafi movement. They lost badly in the elections and are viewed by many Libyans as rebels in search of a cause, since Libyan society is already socially conservative. As for the jihadis, they are concentrated in specific places but they are few in number and are largely detested. Their antics and outrages have embarassed Libyans as well, from the destruction of Sufi shrines to WWII graves. Libyans did not remain silent on all this for long and tribes to matters into their own hands in some incidences that resulted in deaths on both sides. The withdawal of the dubious militias from the city is also a sign of a very different situation.